ReutersPresident Barack Obama and Chuck Hagel walking past each other at the Jan. 7, 2013 White House news conference where Obama announced Hagel’s nomination as secretary of defence. President Barack Obama made his statement on the resignation of Defence Secretary Chuck Hagel from the White House on Monday morning. Hagel and Vice President Joe Biden stood alongside Obama during the remarks. The president began by sharing an anecdote form Hagel’s visit to troops in Korea “about a year ago.” During that trip, Obama said Hagel was asked about his favourite college football team by one of the soldiers in attendance. Obama went on to say a soldier “might have been reluctant” to ask an earlier secretary of defence a similar question. The president said this was an example of how Hagel’s leadership at the Pentagon was different. 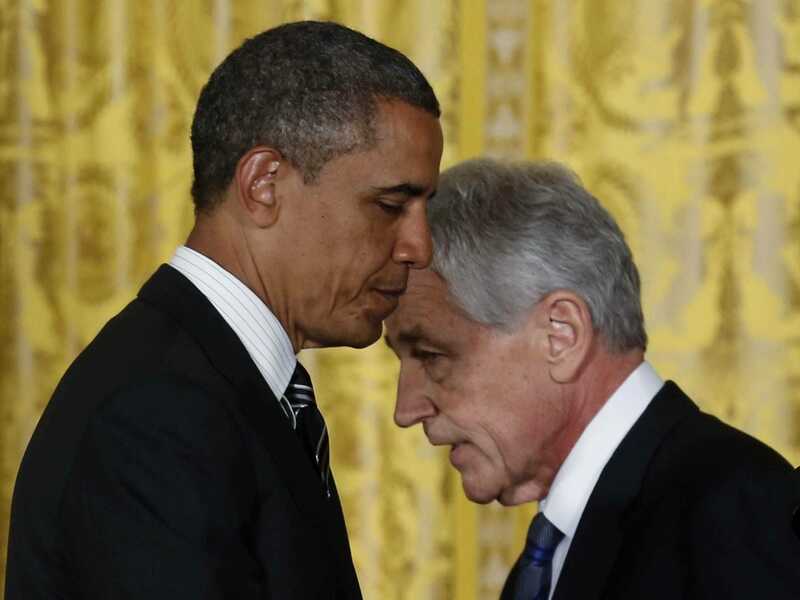 “Chuck Hagel has been no ordinary secretary of defence,” Obama said. “He sees himself in them and they see themselves in him,” said Obama. “On behalf of a grateful nation, thank you Chuck,” Obama said. This post will be continuously updated with details from Obama’s remarks.